92 pages, 8.5” x 5.5”, black & white, soft cover, 10 chapters. Contents include an overview of flameworking, defining your goals, elements of design, and thoughts on excellence and innovation. One of the striking features of this book is an exploration of many of the best developed categories to which flameworking has successfully been applied, making business success most likely for the artist. 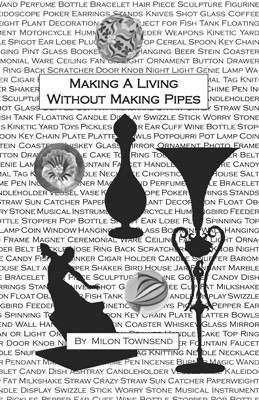 Written as a response to a legal ruling that made pipemaking a crime overnight, this is an exploration of the other avenues and opportunities available to the glass artist. With extensive discussion of the difference between art and craft, one of the most interesting aspects of this small volume is detailed descriptions of the actual working lives of some of the best known flameworkers today.